Saturday was here before we knew it. 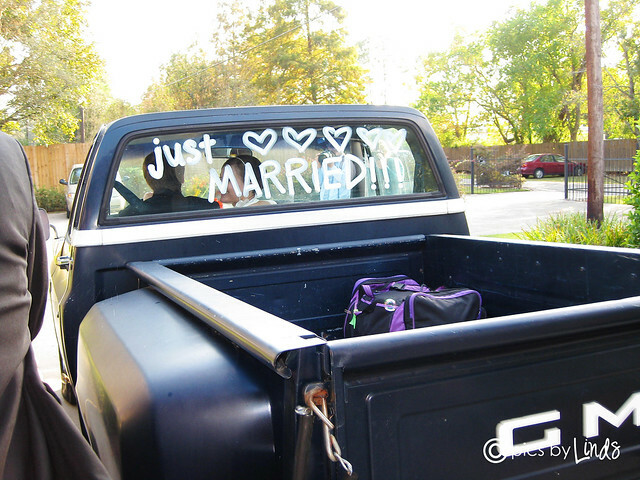 The day our entire family had looked forward to... October 23rd, was finally here. The day started out like any other... we all ate breakfast, watched Meg run out of the door to get her hair fixed, and started the rotations of showers while we each took turns watching Brayden. I was nervous because it was the first day Brayden had ever missed his nap completely. I decided I'd put him down for a nap in the morning instead of the afternoon, and crossed my fingers and toes as we set the plan in motion. Thankfully he stayed asleep until it was time for lunch-- we even had to wake him up! Lunch was kind of crazy; we all started eating and then BOOM all of the sudden it was time to get to the wedding site, and we were all out of the door in 10 minutes. Talk about coordination when you're having to get 8 people out of the door! We got there and the boys got B ready while I helped get Meg ready, and I got dressed myself. Brayden did well the entire time before the ceremony. Until, it was actually time for the ceremony. Drew was already out in the audience. 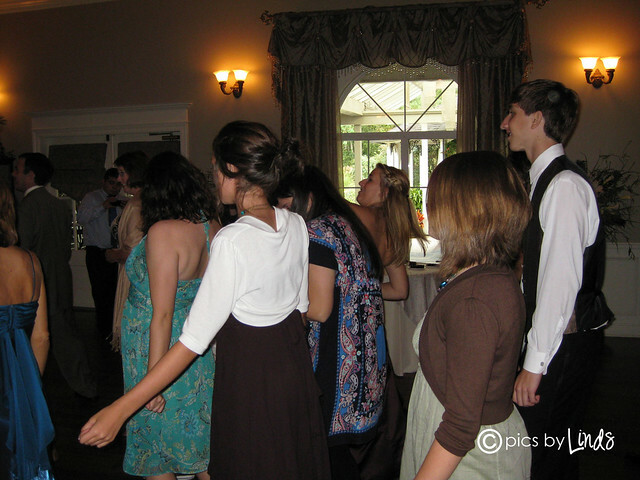 Everyone was in their place to walk down the aisle. And B was screaming. It was a little chaotic as we were trying to figure out what to do. 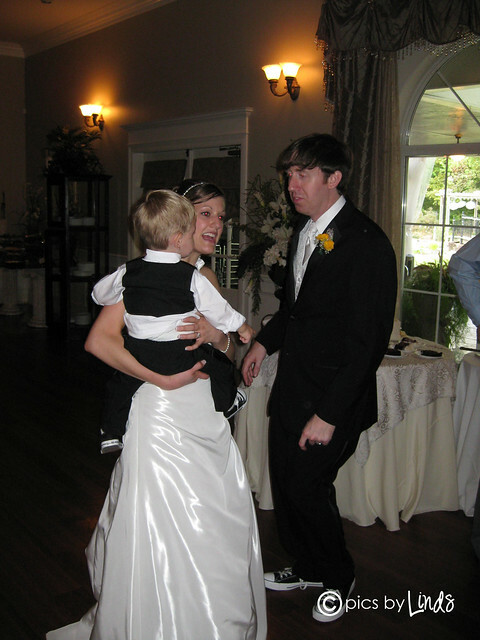 At the final moment Laura decided to walk down the aisle holding him instead of trying to hold his hand. 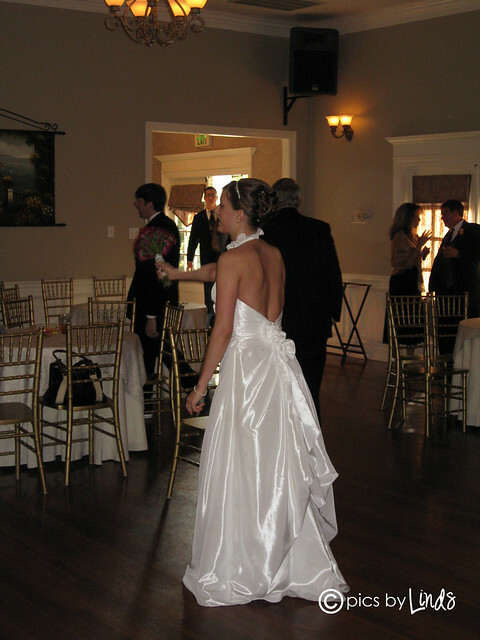 I had walked out just before Laura so I was waiting at the end of the aisle. 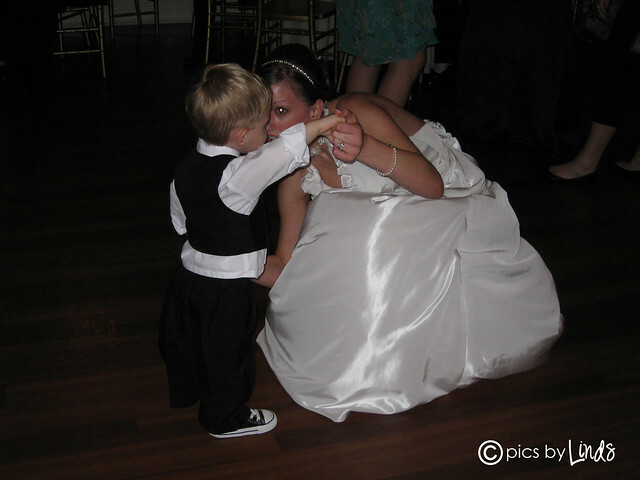 You could hear B screaming in the reception hall (the wedding ceremony was actually outside)... Laura, walked out and B was fussing. The minute he saw all of the people though, he started laughing. That in turn made everyone laugh. 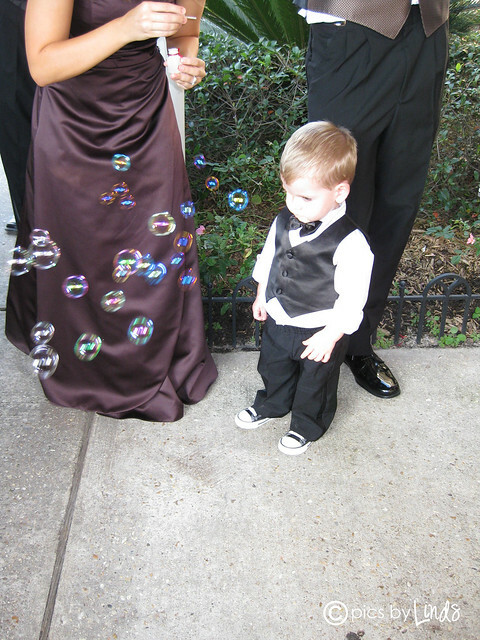 And of course, they all thought he was cute in the little tux. When everyone else laughed B laughed again, and he got an ovation. haha. It was great! They made it to the end of the aisle and then B ran to Drew, just as planned. He even stayed quiet and still for almost all of the ceremony (so thankful for fruit snacks!). Drew had to miss the final 5 minutes to take B out so he wouldn't get rowdy, which was a bummer. But we were worried Drew wouldn't get to see ANY of the ceremony so we were all pleased. 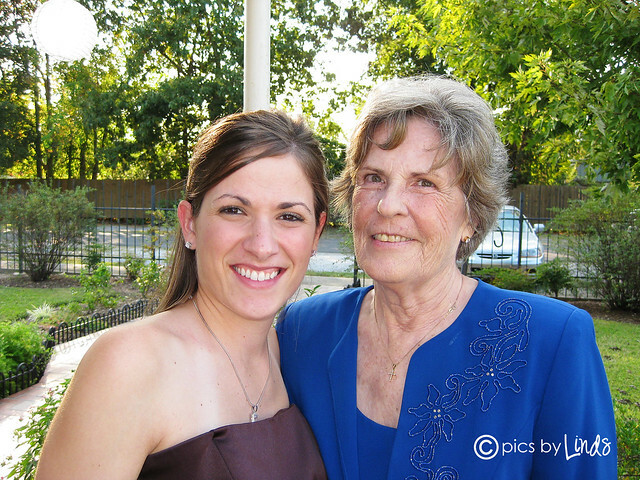 Once the ceremony was over we took the remainder of the pictures for the wedding, and then headed inside to PAR-TAY. The food was awesome, and they had a DJ so we all got in some good jives. Brayden even joined in on the dancing, which was hilarious and crowd entertaining at it's best! 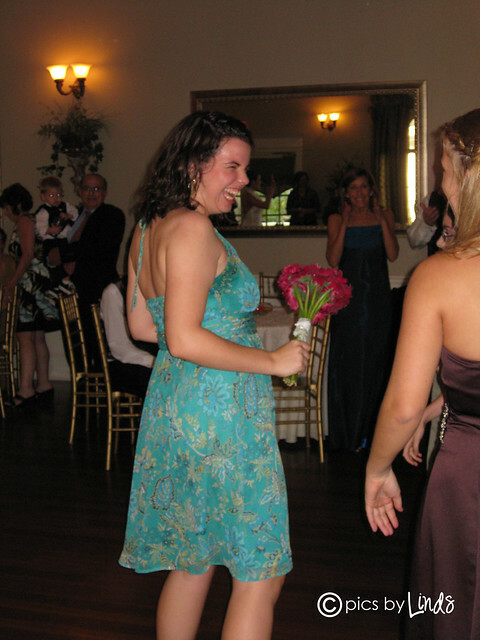 And I have to brag a bit on myself and say that despite the fact that I am ginormous pregnant, I danced to almost every song, including Cupids Shuffle. 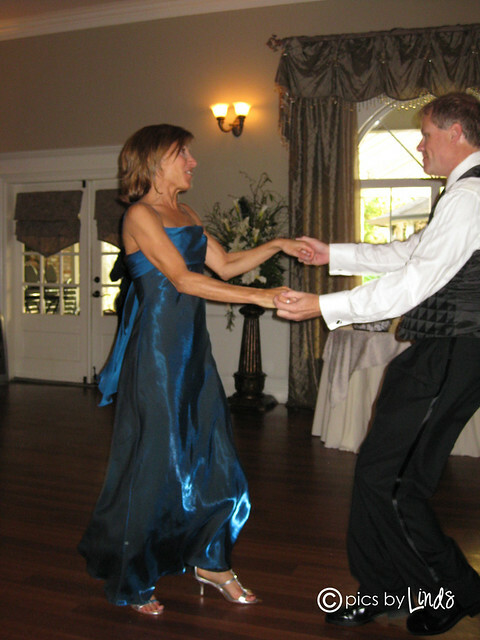 My great aunt came to me after the reception and told me that she was so worried I was going to drop a baby on the dance floor--hahahaha! But I figure, you only live once. 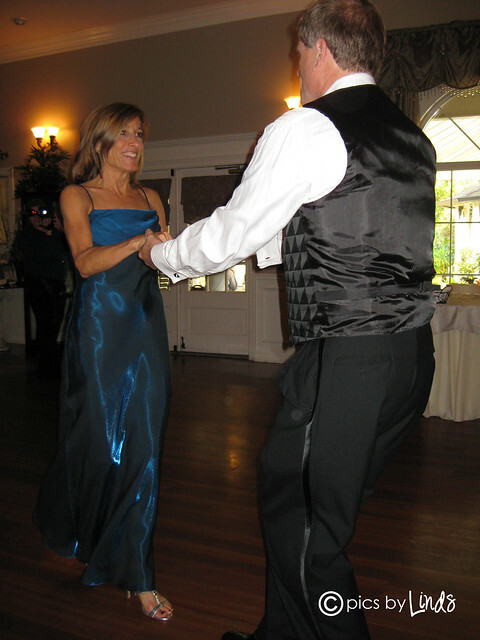 And I wasn't letting my basketball belly get in the way of having a good time with my family! He was probably begging someone for food... he seriously was like a baby bird going from person to person getting bits of food. 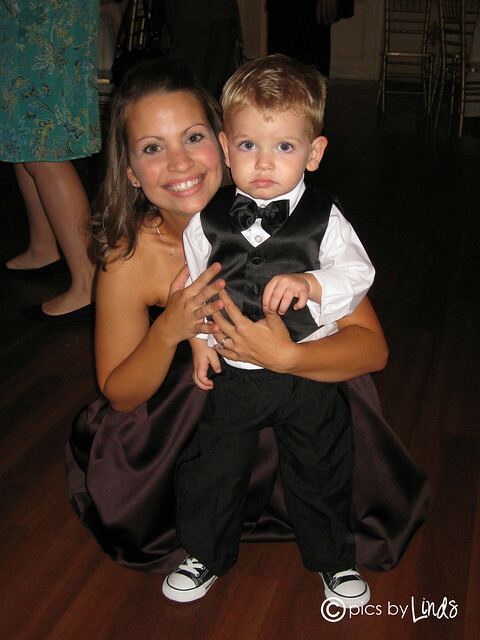 And B in a tux? Yes, he's ridiculously cute. For those of you interested, I purchased the tux, brand new, on ebay for... get this... $26. TOTAL. 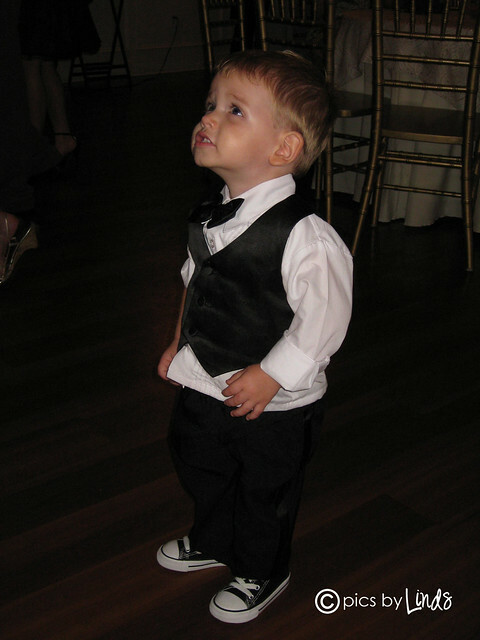 It included everything he wore (he also had a jacket, but it was so hot he only wore it during the ceremony), with the exception of the Chuck Taylors. 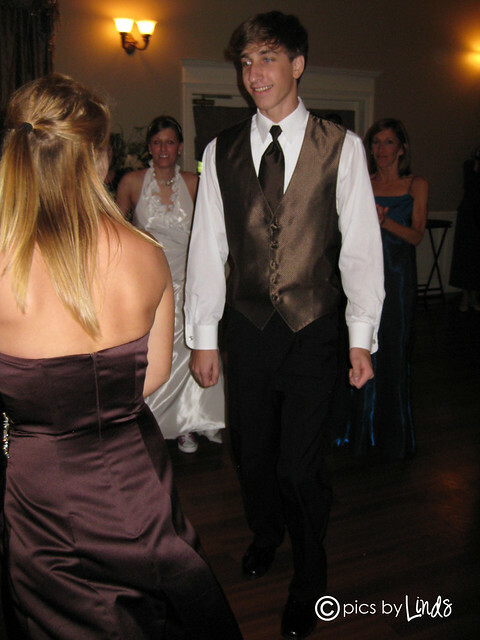 Email me if you are interested in knowing who I bought the tux through. I'd totally recommend them! 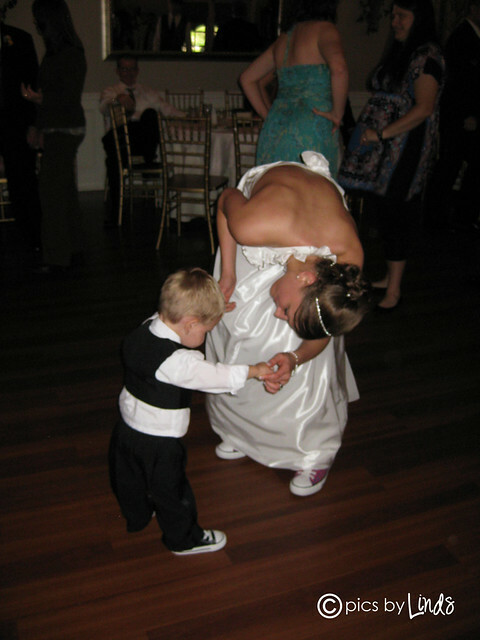 showing his Aunt Meg how to break it down! 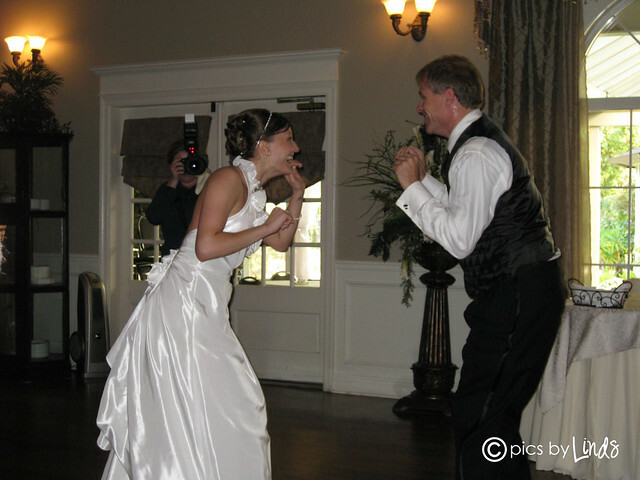 Meg and Dad dancing to "SHOUT!" 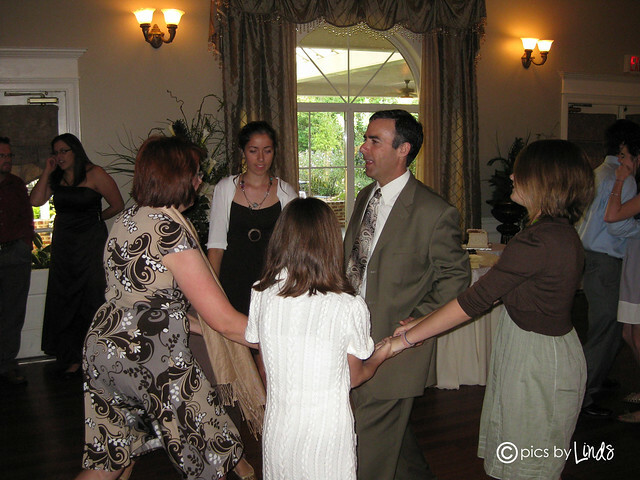 My Uncle's family, dancing as a family... so cute! 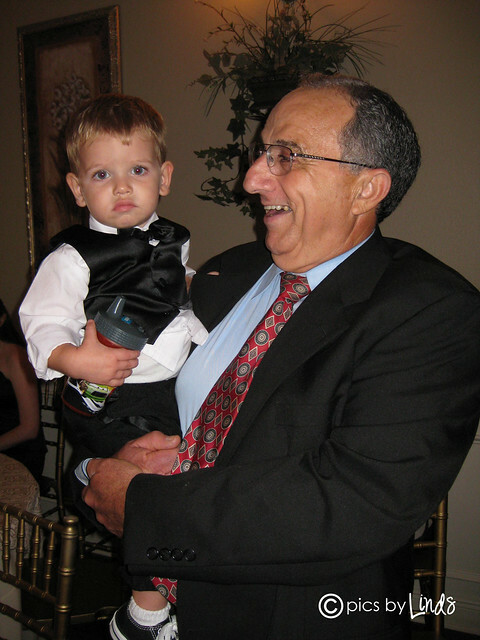 Brayden and his great-great Uncle Mike. Don't let the facial expression fool you... he loved Uncle Mike! 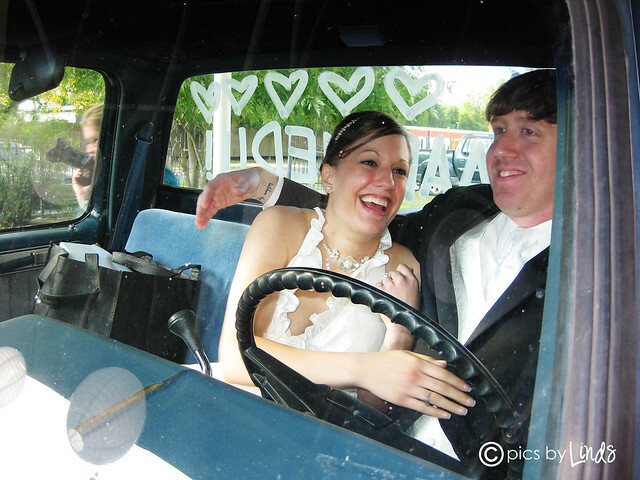 Meg and Ben left the reception in Ben's old truck.... so cute! "BUBBLES!" This boy was in heaven! Can you tell he really likes Sarah? haha! And then it was over. The day we had all waited for had came and went. Thankfully we gained a brother and didn't lose a sister. We all love Ben and think he's the perfect compliment to my sister. Can't wait to watch them grow in this new journey of marriage!